Artemi Panarin's name has been involved in a ton of trade rumours as we approach the deadline because he's a UFA in the summer and although the Jackets are in a playoff spot, they risk losing Panarin and Sergei Bobrovsky for nothing if they don't trade them. With just 17 days left until the deadline, Panarin has reportedly made a big change that could impact what happens on deadline day and after. Forgot Max Pacioretty, too, switched agents. What a year in that business. Not only did Panarin change agents, but he'll now reportedly be represented by Bobrovsky's agent. 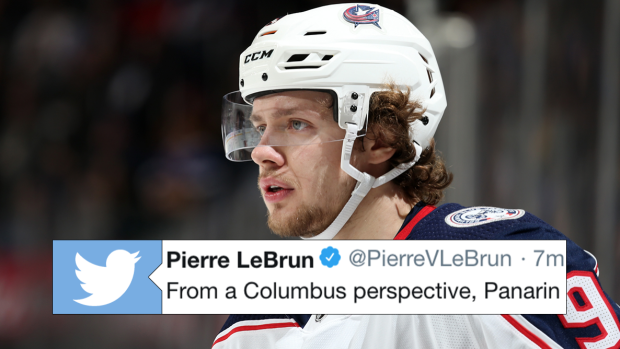 From a Columbus perspective, Panarin switching to agent Paul Theofanous (Bobrovsky's agent) doesn't change much. Panarin still wants to head to market is the understanding. Trade deadline day just got a whole lot more interesting.